Each year, more than 1,000 people are killed and more than 40,000 are injured in highway work zones in the U.S. That’s 40,000 injured — about the size of the Purdue student body in West Lafayette. Dulcy Abraham thinks those stats can be curbed. 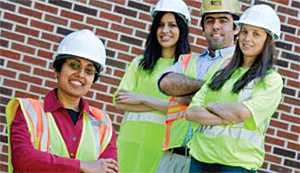 Safety Guru: With the support of hard-working civil engineering students behind her (left to right: Vanessa Valentin, Ali Mostafavi, and Kasey Faust), Dulcy Abraham is passionate about making construction practices safer. Abraham, professor of civil engineering and construction engineering and management, is completing a five-year project funded by the National Institute for Occupational Safety and Health (NIOSH)/Centers for Disease Control to understand what factors contribute to the safety of workers at risk in nighttime highway construction and maintenance zones. At a NIOSH research workshop in fall 2009, Abraham presented a training tool for workers, complete with interactive online quizzes. Along with civil engineering graduate students Joseph Louis, Ali Mostafavi, and Vanessa Valentin, Abraham is also developing a decision support system for highway construction planners. It will include a computer interface with searchable topics. Additionally, Abraham is designing a three-lecture course module. Abraham is also looking at roadway inspection strategies. Too little inspection and the performance of the roadway may be compromised. Too much inspection becomes unsustainable in terms of personnel, time and funding. Roadway inspectors train for the job via a mentorship model, but as the cadre of expert inspectors approaches retirement age, the industry faces the loss of expertise on how to achieve that balance. Abraham says they’re trying to capture the “insider knowledge” of the older inspectors with many years of industry experience. To this end, she’s deployed a questionnaire to gather perspectives and insights. Abraham is not always concentrating on the road; she also thinks about water. The Westlands Water District in Southern California is the target for her next project on resource management, where Abraham is taking a system-of-systems approach. “How do you get all the stakeholders together to agree on water allocation and access issues?” asks Abraham. Kasey Faust, a graduate student in civil engineering, works with Abraham to predict the current water system’s sustainability. Downstream they hope to determine the ideal organizational structure for the water infrastructure system. They also aim to predict the system’s response to new policy, technology and other potential changes to the overall water system. The California Westlands Water District shares similarities with the West Bank in Palestine, where Abraham traveled in May 2010 with four students as part of a global design team. The group studied a water resource management scenario where problems are magnified because of scarce water and the current ineffective water allocation and pricing models. The global design team also visited a refugee camp in Amman, Jordan, where they discovered cultural differences in resource management. Gray water harvesting, for example, is a less palatable concept there. Abraham is interested in applying research in cities abroad to the project back home. She is looking for ways to “cross-fertilize” creative solutions to problems that many different communities share.